So a couple of weekends ago, I had a booth at Alamo City Comic Con in San Antonio. My friend Annie helped me setup and run the booth, and despite the ENORMOUS amounts of people there (I get VERY wonky in crowds), I had a great time. I thought I’d share a little of it for you, as a vendor, to show you what it’s like! And there’s my booth (which accidentally turned out way cuter than I intended. Hm.). If I had planned it better (or knew how, exactly), I’d REALLY want it to look like one of those things that wheels into town playing calliope music and sells you snake oil and moves on to the next down? THAT sort of feel! I wish I knew how to make that happen… I had copies of our Share With Me book there, sticker and postcard packs of our collaborations, but mostly I focused on the Dream Creepers, and told people the story about how they came to be. I was playing with resin faces and made Myla a doll. She loved it and brought it places. Some little girl said disgustedly, “Ew, that’s creepy!” and Myla smiled politely and said, “well they have to be a LITTLE creepy to chase the bad dreams away.” And that’s how they came to be. 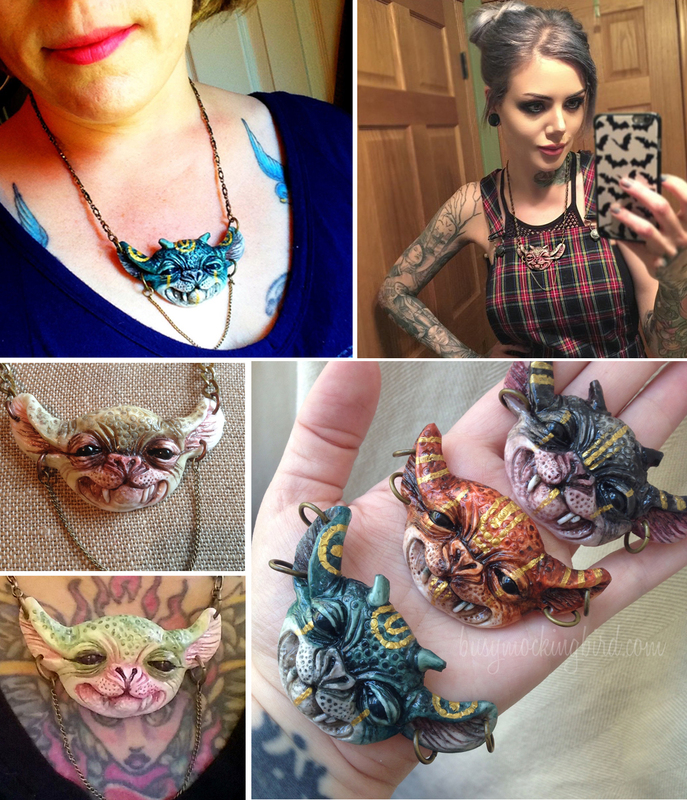 I also had necklaces and pins of the little monsters, and my handpainted teeny weeny things. People say things and forget you’re there. 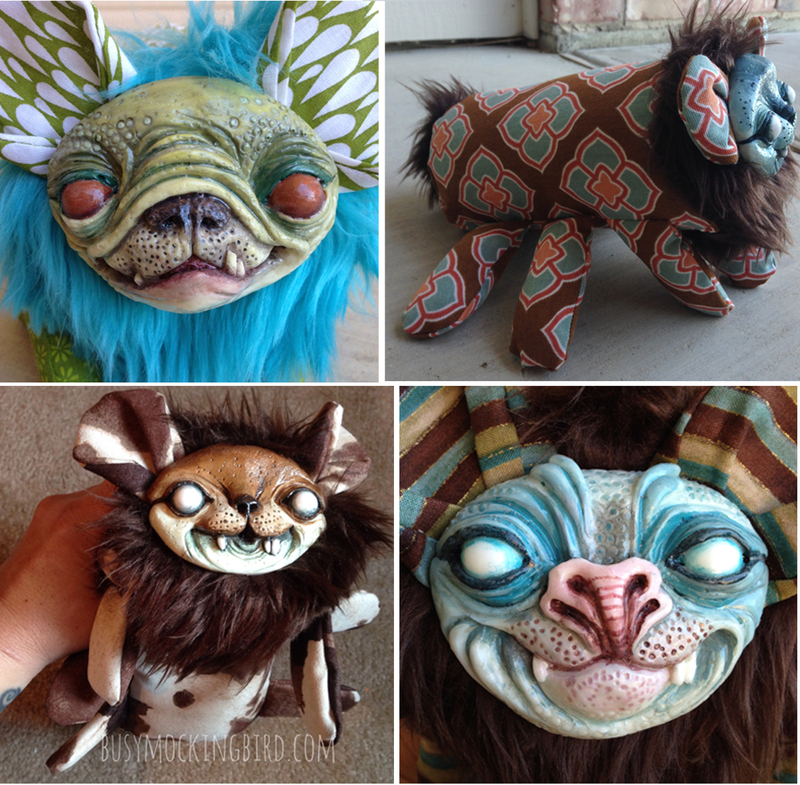 For three days, the number one thing I heard the most was, “Those are soooo creepy…but now I really kinda want one!” That was always sweet, and I loved to hear it. I love that little conflicted space between creepy and cute, so I totally understand that comment. I also heard a lot of “That looks just like my DOG!” Also cute. But what I also heard was a bit of very open rudeness. “That’s stupid, who would pay for THAT?” “Oh, they’re probably made in China” (despite my having written “HANDMADE” as frequently as possible). “Those are gross, put those down.” “People BUY these?!?!?! ?” I mean, really–I’m standing right here. In ARTIST’S ALLEY. Which means I MADE these things. Listen, I totally get that my little creatures aren’t for everyone, but remember that thing your mom always said about not having anything nice to say….? GUYS seem to really like my Dream Creepers. I dunno why, but often the first person to be caught by my Creepers as they walk buy is often male. Plenty of girls and women enjoyed them too, but I thought that was a funny little tidbit. Its great to be friendly to your fellow boothmates. Not only is it great to be able to walk around and see all the booths as they set up and talk to other artists and vendors before anyone gets there, it’s super awesome to be friendly with the people in the booths around you. Listen, you have to spend three days with these people–do yourself (and them) a favor, and make friends. That way, if they need a bathroom break and don’t have someone to watch, they can ask you to keep an eye on their booth. If you’re going out, ask if they need anything. If they see something fall off of your signage, they can let you know & help you put it back up. If they break down their booth for the night and forget something, you can let them know. Good times all around! 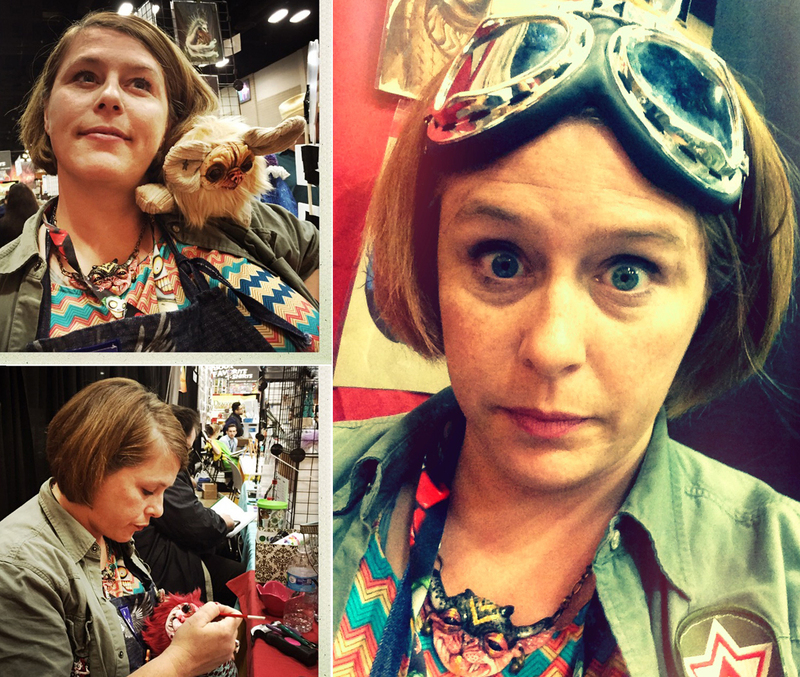 One of the ladies from another booth bought one of my little monster puppy brooches, which went SMASHINGLY well with her steampunk outfit! Smile and say hello. As a vendor it’s always such an awkward thing to try to guess what people want. Some people don’t want you to talk to them at all. Some people want to hear more. Most people seemed to really enjoy and appreciate everything once I told them the story of Myla and her Creeper, and how she names them all herself. I try my hardest NOT to be on my phone (unless necessary), because I always think that’s awkward when you walk up to a booth and someone’s too busy on their phone to even notice you. And since I’m not a snazzy salesman (I’ve seen some really good ones that make you WANT to buy things actually in an awesome and not creepy way) and I’m not super chatty, so I just try to look at everyone and smile and say hello. “Hey, how’s it going?” “Hey there!” “How’re you?” This is my “friendly arsenal.” It doesn’t hurt much. When I’m not using my super-magical friendly booth-powers, I sketch. Annie had a small sketchbook, and was asking other artists to sketch in it. 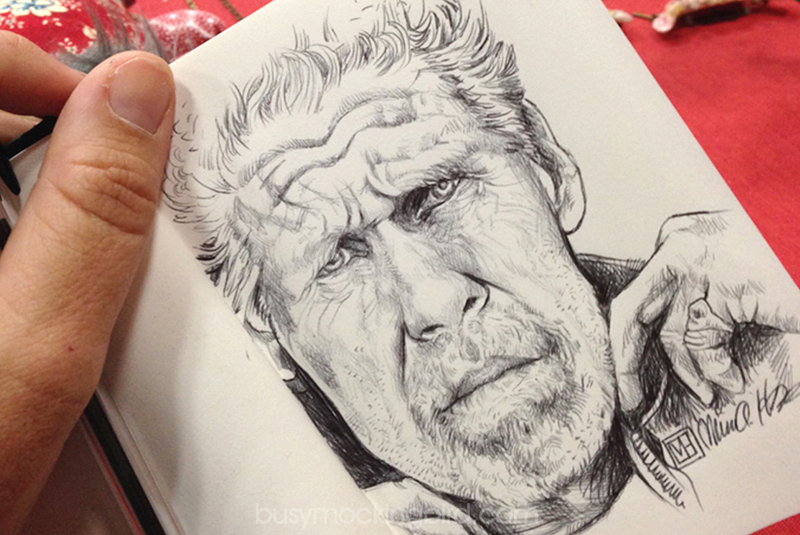 And since she & I were sitting there quite often, I sketched quite a lot in her sketchbook. I try to lay my book flat on the table, in case people want to see what I’m drawing, because I don’t mind it at all, and sometimes it sparks a bit of conversation. I try to look up quite often, so people can see I’m still engaged in my booth. I even got a blank Mad Max comic cover (it has an actual comic inside, but they put a blank cover on it specifically for artists to create their own custom covers, and then some artists sell them…But not me, because: MINE). 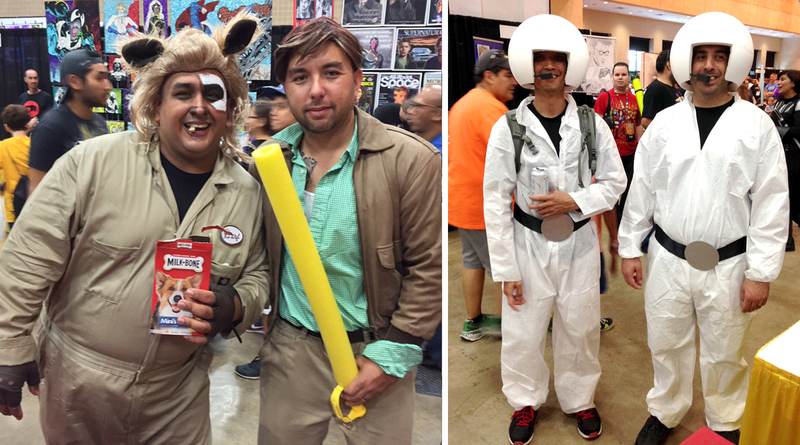 So even as a vendor running a booth, I still got to enjoy one of my favorite parts of a Comic Con: the COSPLAY! 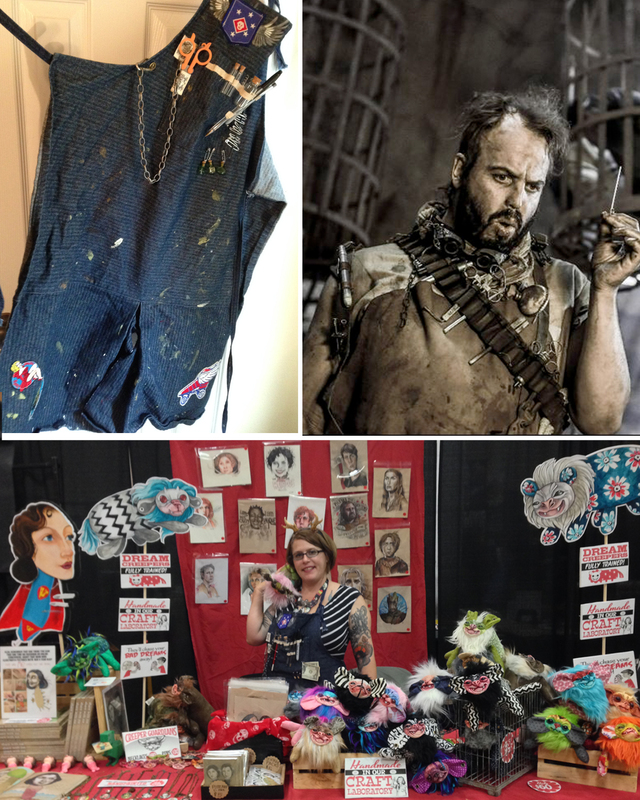 I absolutely LOVE that people get crafty and make their own costumes, and love it even MORE when they mix it up. I chased this little punk Ariel all over to get a picture, and finally nabbed her. She has Flounder in a net on her trident, and her crown was spectacular. This version of Flash (with Wonder Woman) had some whole routine that drew a crowd, because he had a yellow thong-thing around the back that made people laugh as he posed for photos. 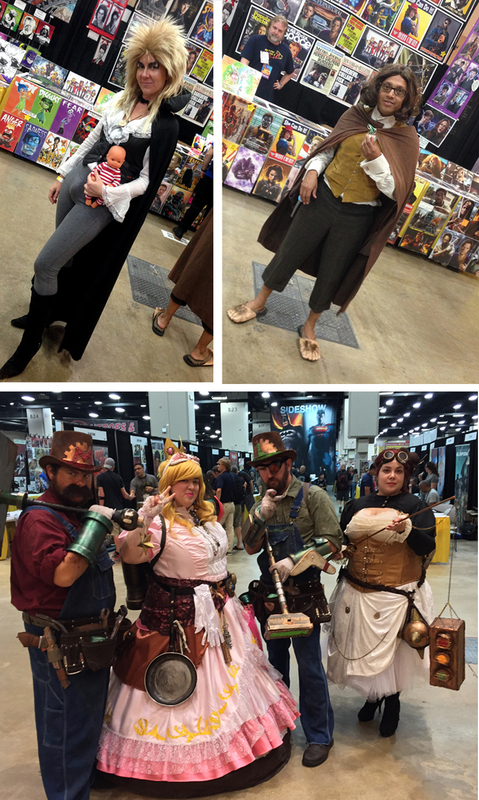 This lady did a spot-on Goblin King with the stolen baby from the Labyrinth (even recreating Jareth’s awkward…um…”bulge.”) And Frodo posed with his Ring. His little feet were flip-flops with plastic hairy feet on top! This Hawkgirl had a very impressive wingspan. And look, a lady Totoro!! She has the ears and little leaf on her head, and under her dress were attached several little soot sprites. So cute! Jerry’s Artarama had a booth that demo’d bodypainting, hence the lady Predator. And here’s a VERY fancy lady in a beautiful and extremely ornate costume (who I thought was queen of hearts, but maybe now I’m thinking Joker?). 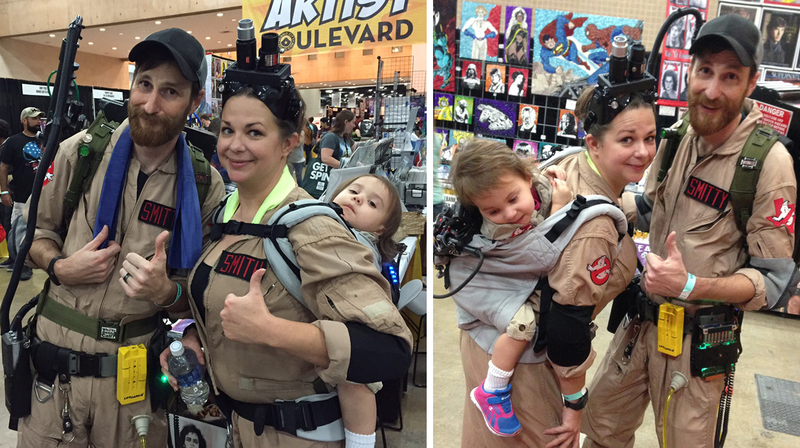 This cute couple dressed as Ghostbusters, and had their kid cleverly strapped on the back as one of the proton packs. 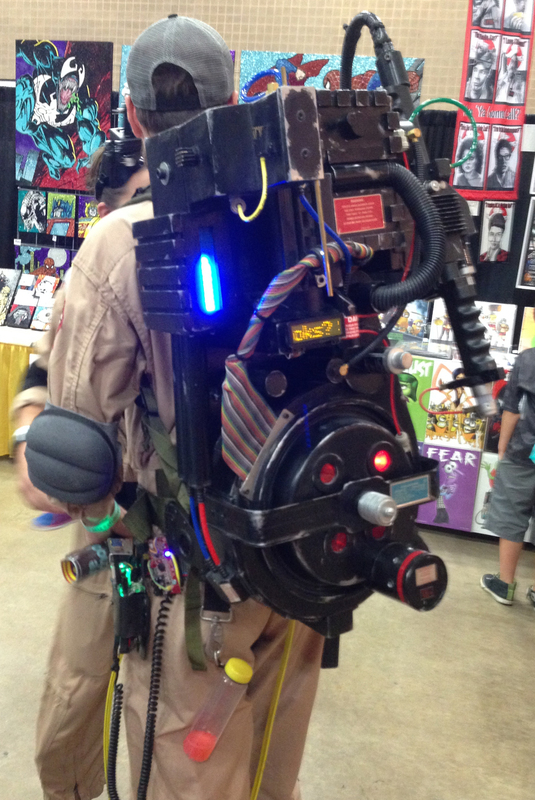 The dad’s proton pack even lit up and blinked and looked all sorts of cool. But the mom’s proton pack was ALIVE, so there! 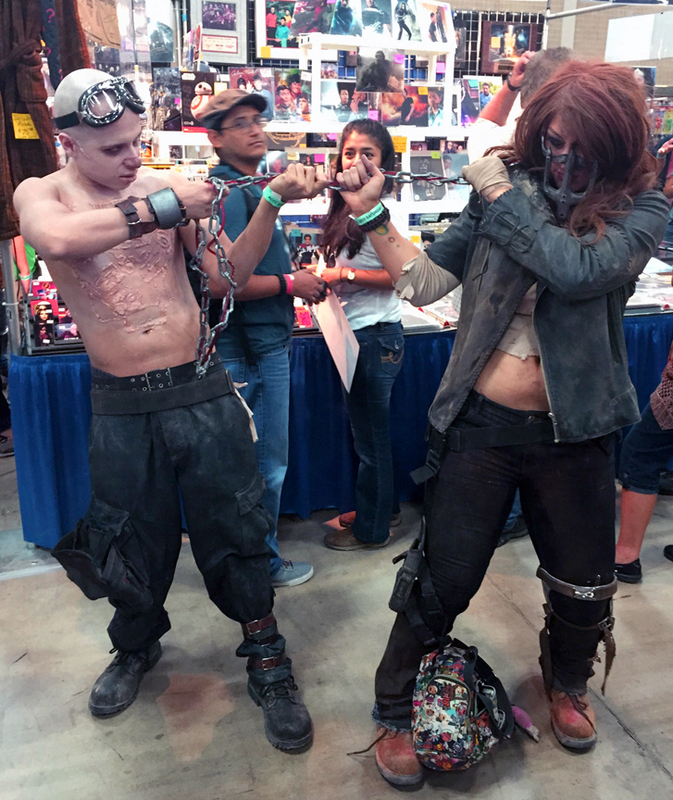 And I practically YELLED at these two to stop and take a picture because OMG GENDER-SWAPPED MAD MAX AND NUX!!! She had pretty amazing detail going on her costume, even down to the leg brace (which people often overlook) and her face muzzle was pretty realistic. 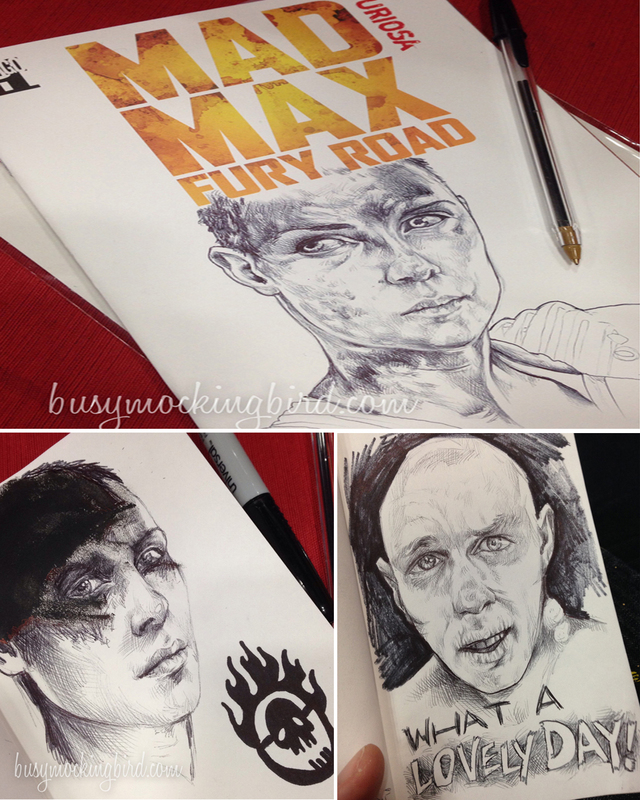 And Nux had some great fake scars on his chest (the V8 “scar tattoo” from the movie). The chain with the bloodline attached was the icing. So shiny! So chrome! And look! SPACEBALLS!!! Is that not a pretty hilariously awesome Barf? 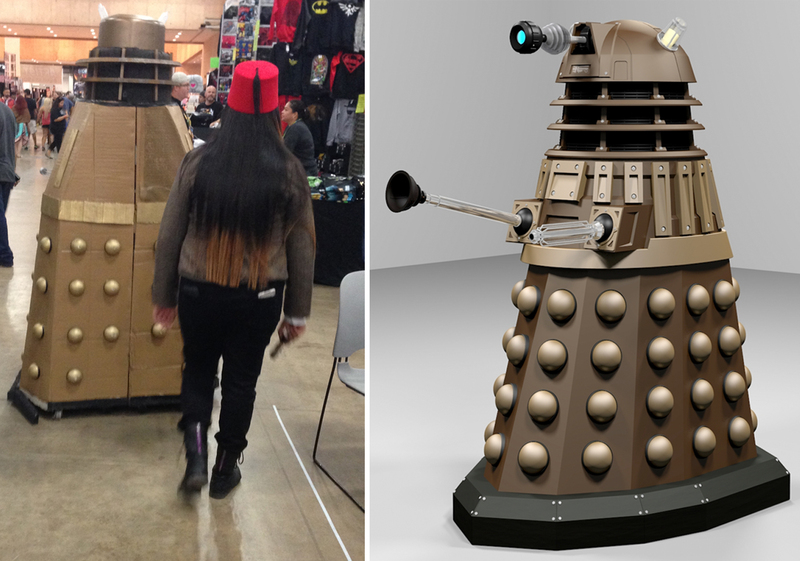 There were SO many great costumes, but THIS girl blew me away. She came ALL three days in THREE different costumes she built herself. The first day, she was Lady Loki. 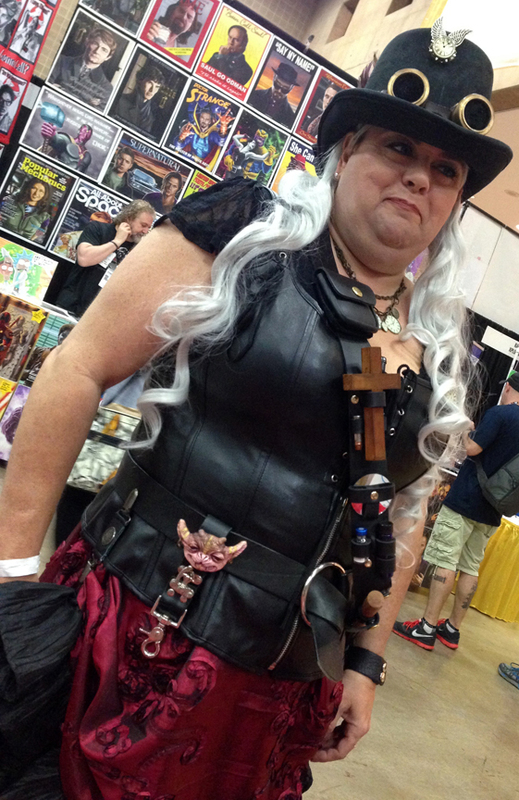 The second, day, standing in line for Ron Perlman, I saw a Hellgirl and thought “she looks familiar…” Until we realized it was Lady Loki from the day before!!! 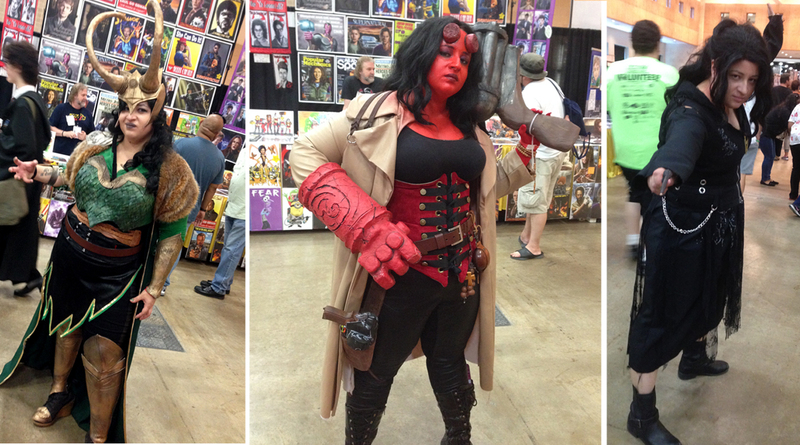 She got a photo with Perlman in her Hellgirl costume, how cool is THAT?!?! And the last day (although my photo doesn’t do it justice), she threw on a last-minute Bellatrix costume from Harry Potter. She told us she was part of a cosplay group that dresses up and visits kids in schools & hospitals, and I wish I knew how to reach her so I could give her a long-distance hug for all-out awesomeness. But some of these photo meetings are a big rush job. 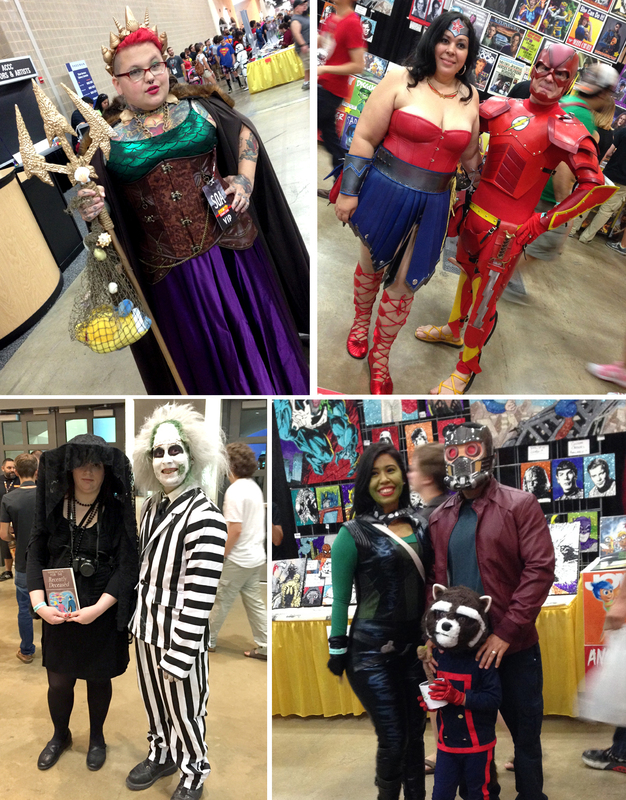 Celebrities are part of the fun of ComicCons, and they charge different prices for photos or autographs (often in separate lines for separate fees). After waiting nearly an hour in our Perlman line, we were rushed in, and in the span of about 15 seconds, we were sort of shoved up against Ron, and ushered directly out. I had barely enough time to shake his hand and say “thank you so much,” which is why look completely unprepared and derpy in this photo. I mean, what is this face? Where is my neck? 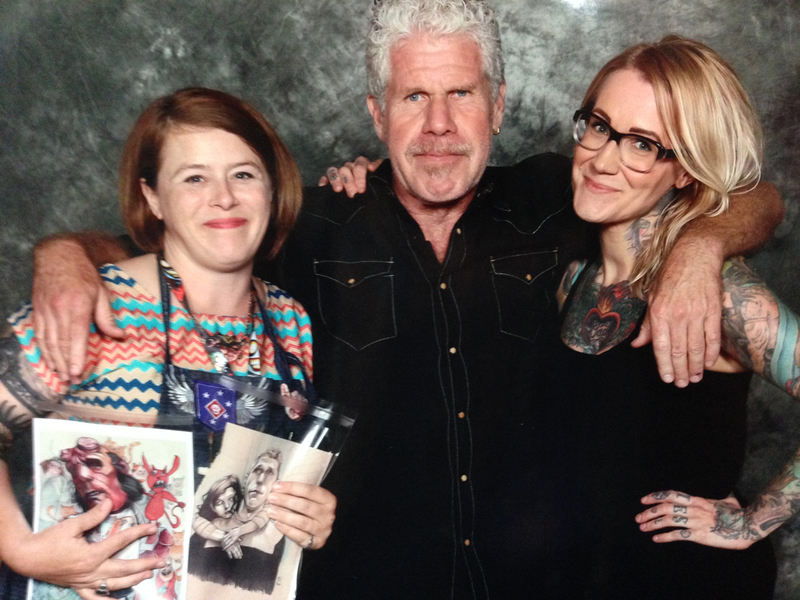 I didn’t even get a chance to show him my drawing of him as One with Miette, or the drawing of Hellboy at the petshop that Myla and I did. Poop. In my experience, the better opportunity is to get something signed, because at least then you get to talk to the person for a bit. And if you’re going to meet anyone, a good bang for your buck (in my very limited experience) is Michael Rooker (Merle from Walking Dead, and Yondu from Guardians of the Galaxy). I met him last year at Wizard World in Austin. He’s so super friendly to everyone, talks to you like you’re old friends, and makes you all around laugh. He’s got that Southern gentlemen swagger with a whole mess of cocky, but it sure does crack you up. 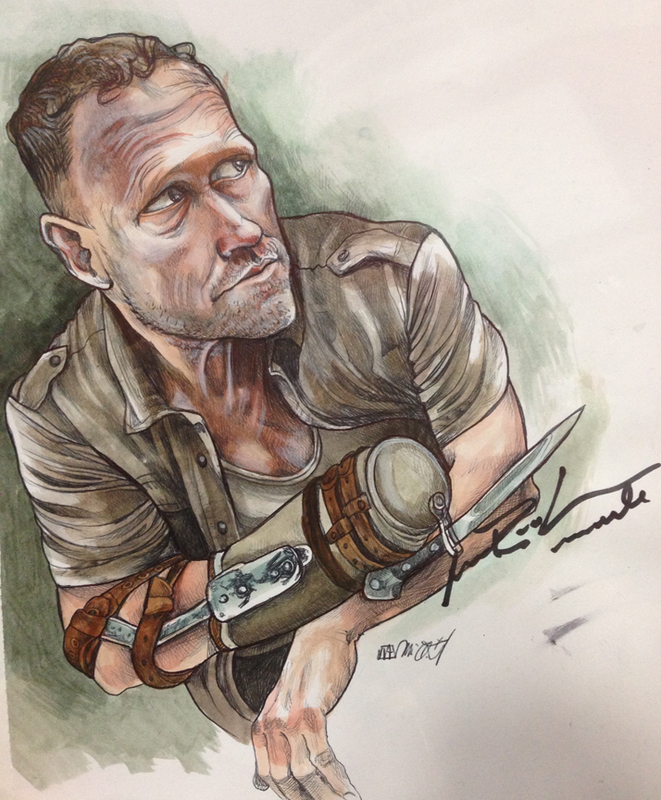 Annie met him, got this drawing signed that I had given her of him as Merle from The Walking Dead. According to Annie, he said, “Did a girl or a guy draw this?” and when Annie answered a girl, he said, “Ah! Girls always seem to draw me much more better lookin’ than I am. Hahah!” He got a kick out of it. 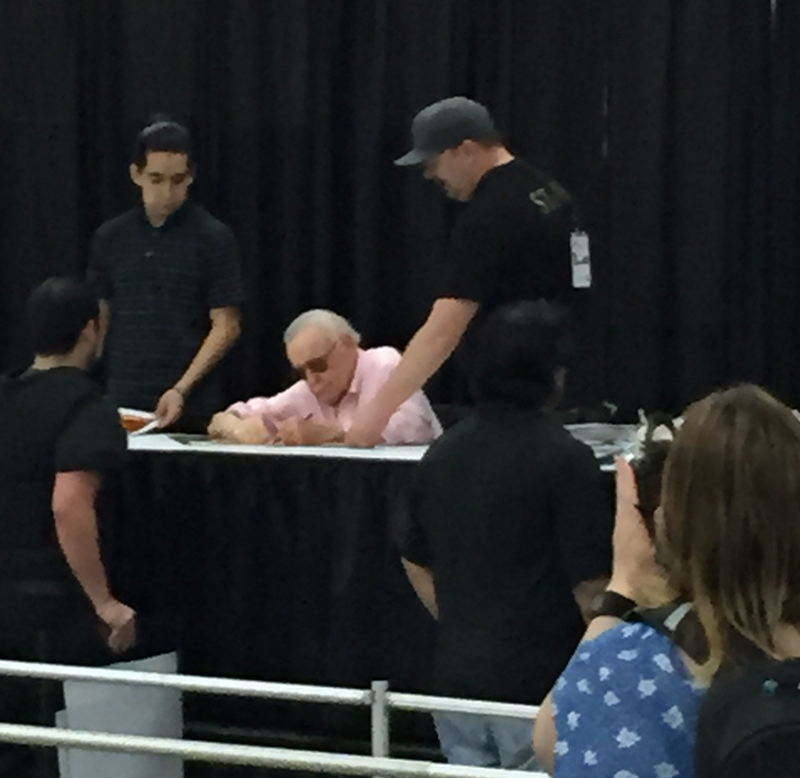 And of course, EVERRRRRYONE wanted to meet Stan Lee, aka Stan the Man. Stan Lee CREATED all the superheroes everyone loves. He practically INVENTED the whole superhero genre, and he’s in his 90s, and he’s still coming to these things and meeting people! Thankfully (for him), they seemed to make it pretty painless for him, keeping him seated most of the time, and blocked off so that he wasn’t bombarded or overwhelmed. Neither Annie or I went to go see him (he was by far one of the most expensive guests to see, understandably), but she snapped this photo from quite a ways away. Still, good for him. So there you go. That’s pretty much the whole experience of the convention, from my point of view at my artist’s booth! Myla and my mom came to visit the third day, but the experience was a bit overwhelming for Myla, I think, and after a little shopping and bouncehouse shenanigans, it wasn’t long before my poor mom had to drive her the two and a half hours back home. Poor girl was worn out. And so was I!! I haven’t been to many cons, and the couple I’ve been to, I’ve been to as a vendor. I like walking around and meeting other artists and vendors before it’s open so there’s not a huge crowd. I like sitting at my little table and meeting people. I like talking about my work, and hearing stories from other people about their work, and I love seeing all the cosplay creativity. But it sure does wipe you out! 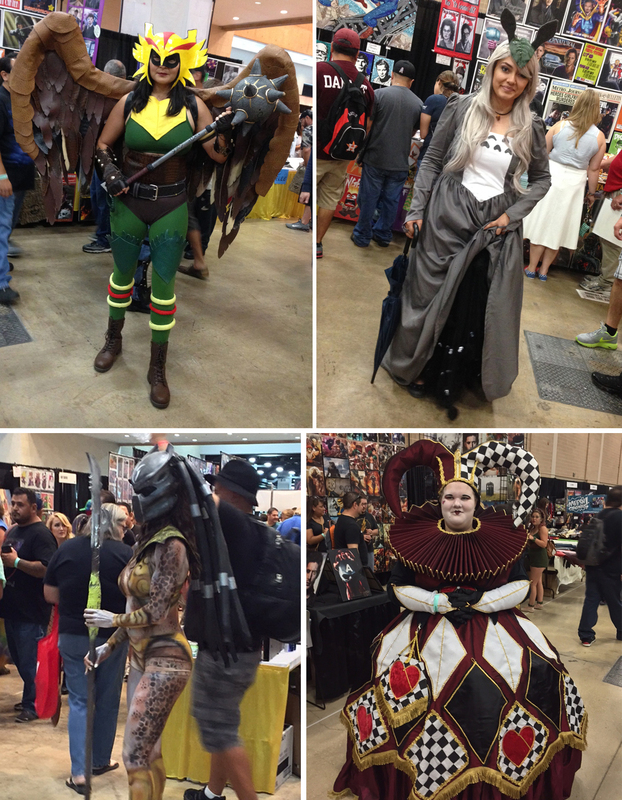 In any case, I’m going to do one more this year: I signed up last minute for Wizard World in Austin Oct 30 – 31. It’s a short one, but I’m sure it’ll be fun. Myla’s going to be there the second day, dressed as James from Team Rocket (she’s WAYYYY into Pokemon right now). So if you’re anywhere near there, and you’d like to celebrate Halloween surrounded by cool costumes and great gear, COME SEE MEEEEEE!!!! 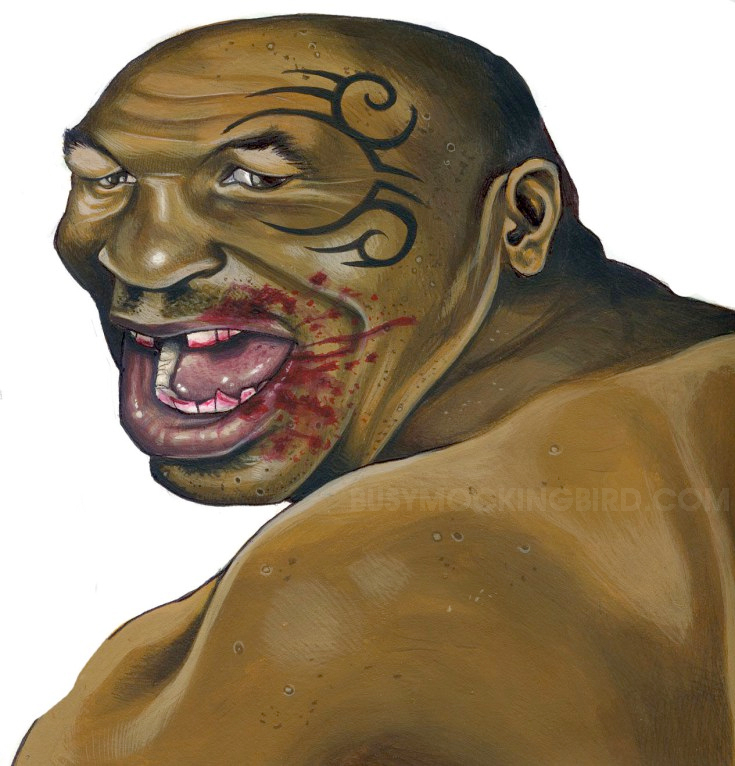 PS: Mike Tyson will be one of the celebrities there. Weird, huh? I’m afraid if he ever saw this (very very old) caricature I did, he may rip off my ears with his teeth, so SHHHHHH let’s just keep that between us…AUUUUUGHGGHGHGHHHH!!!! !